Ben Bradshaw re-elected as Exeter remains Labour – Thank You! Thank you to all of those who voted Labour on Thursday 8th June. When Theresa May called this unnecessary and costly election it looked like Labour could be facing defeat in Exeter and across Britain. The arrogant Tories campaign nationally was a disaster and Labour’s ran smoothly and boosted by a popular manifesto. In Exeter we secured the highest percentage of the vote of any party in Exeter since 1923. Whilst nationally turnout was 68.7% in Exeter it was once higher at 71.7%. Over 34,000 people voted for us, more votes than we have ever achieved before and an incredible 62% of the vote. The growing success of the Labour Party in Exeter continues, two years ago securing 30/39 seats on Exeter City Council, our largest majority ever and in May of this year securing 7 seats on Devon County Council under challenging boundaries. 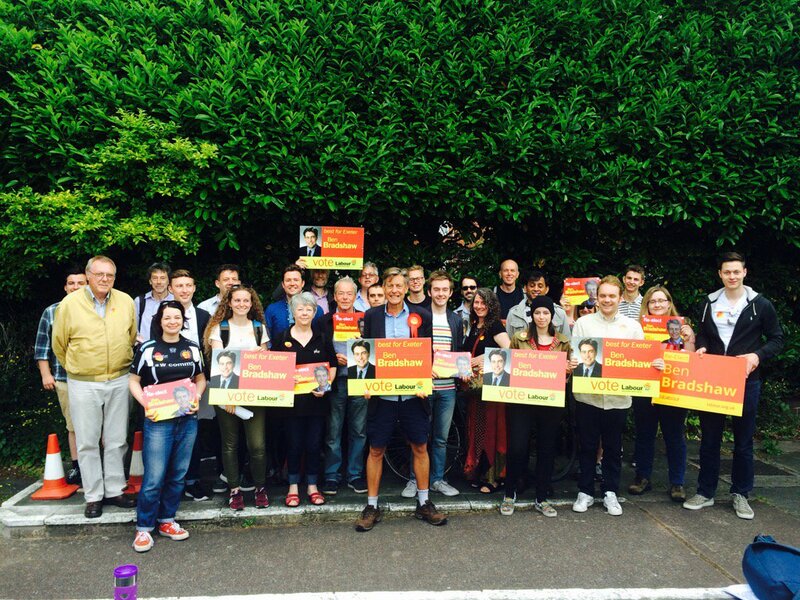 Across Exeter we easily had over 350 volunteers helping just on Election Day itself. Since the campaign began there were far more than this, with people going out in the area of the city they live, coming to the office, traveling in from other areas of Devon and even coming from Taunton, Bristol, Surrey, London and Glasgow. It was everyone’s efforts which made this huge triumph possible -; I am sorry I will not be able to thank you all personally but know that whatever you did helped and is appreciated. Without people doing all they could – be it displaying a garden stake or poster, donating what they could afford and offering time to help with tasks both in the office and out. People cancelled holidays, hardly saw their families and got very little sleep. This is what allowed us to achieve this fantastic result! Thanks to the amazing efforts of our hundreds of volunteers we have had over 81,000 conversations with electors in Exeter since the last General Election and over 31,000 conversations with electors since 18th April 2017 when this election was called. This is an incredible achievement and allowed us to run an effective and winning campaign.